A 47-year-old man was stabbed twice in Blackpool last night. The victim had been walking with a friend along Station Road when he was attacked at about 9.20pm. Now detectives are launching an appeal for witnesses to come forward. A spokesman from Blackpool Police said: "A 47-year-old man was presented at Blackpool Victoria Hospital with two stab wounds. His injuries are not life-threatening. "Enquiries revealed the man and a friend were walking along Station Road following an evening out when the victim was attacked. "It is believed the pair had stopped to speak to a young child moments before the assault happened. "Police are appealing for witnesses and are keen to trace a taxi driver who took the wounded man to hospital." Anyone with information should contact police on 101 quoting log number 1541 of September 7 or independent charity Crimestoppers on 0800 555 111. 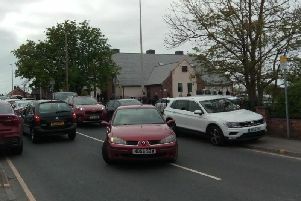 Police called in to help bad parking at Blackpool school: "Just park your car and walk!"